A friend of mine posted recently on Facebook, a photo taken from her hike on the Indian Creek Trail at Hanging Rock State Park, NC. I immediately recognized the view! Many lovely memories came rushing back of hiking a portion of this trail which leads to two waterfalls. Window Falls and Hidden Falls are beautiful, easily accessible falls, that offer a welcome respite from the hiking. Maddie and I have gone twice now. The first time we went, Maddie didn’t fare so well with the more treacherous Window Falls trail. Though they have made rock steps to lead you down to the Falls, these proved too steep and uneven for her 9 year old legs. Several “falls” later, with scraped knees and lots of tears, we determined that Hidden Falls was the one for us! So the next time we went, at 10 years old this May, she and I opted to just enjoy Hidden Falls. Armed with my sketchbook, I happily drew while she climbed all around, above the falls, following the rocks and paths made by the little river that forms the Falls. I don’t even carry a camera, nor do I have a phone with a decent camera. I carry my sketchbook. 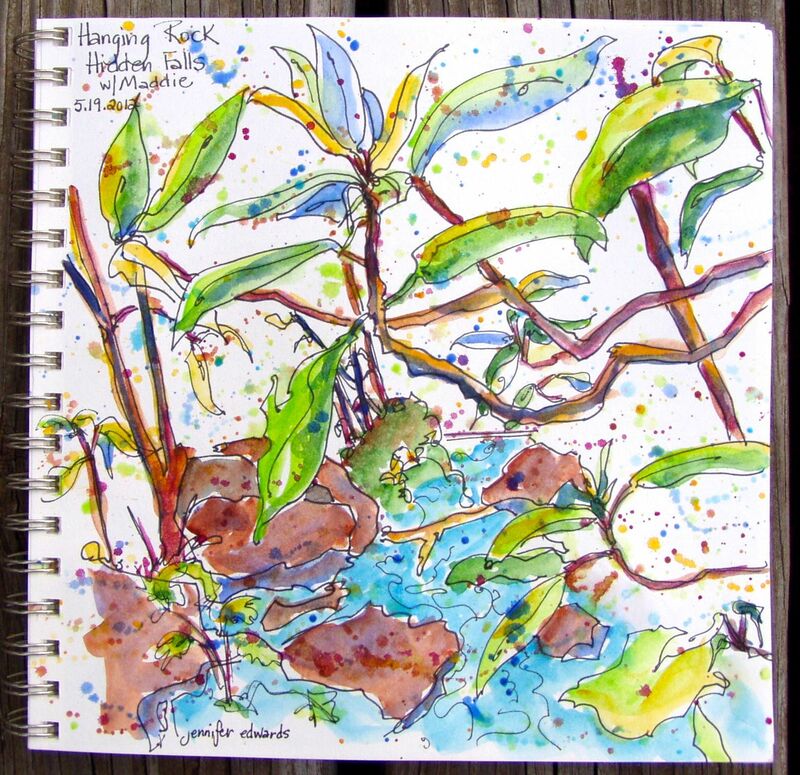 When I look at this drawing, everything comes back to me: the cool of the undergrowth, the sounds of quietly rushing water, the “oh look at this Mommy” and “I just love hiking Mommy” sounds as I sketched the lines of the beautiful jumble of rhododendron, rocks, water, etc. Color gets added in later…a delicious way to RE-live a perfect moment. Now I’m pining for a hike, with no open slot in my life for it anytime soon. But I’ll carry these memories with me, thanks to my friend, Sheri, whose photo jogged them back to the forefront of my mind. So vivid and colorful sketching! I love it! That’s why we love sketchbooks sounds, smells, everything comes back from a moment captured on paper! Smart lady to capture the moment in drawings! I love your work! The colors and line in this are beautiful. And the poem about the tree in an earlier post is wonderful. Thank you so much Linda! And thank you for visiting and taking the time to comment!